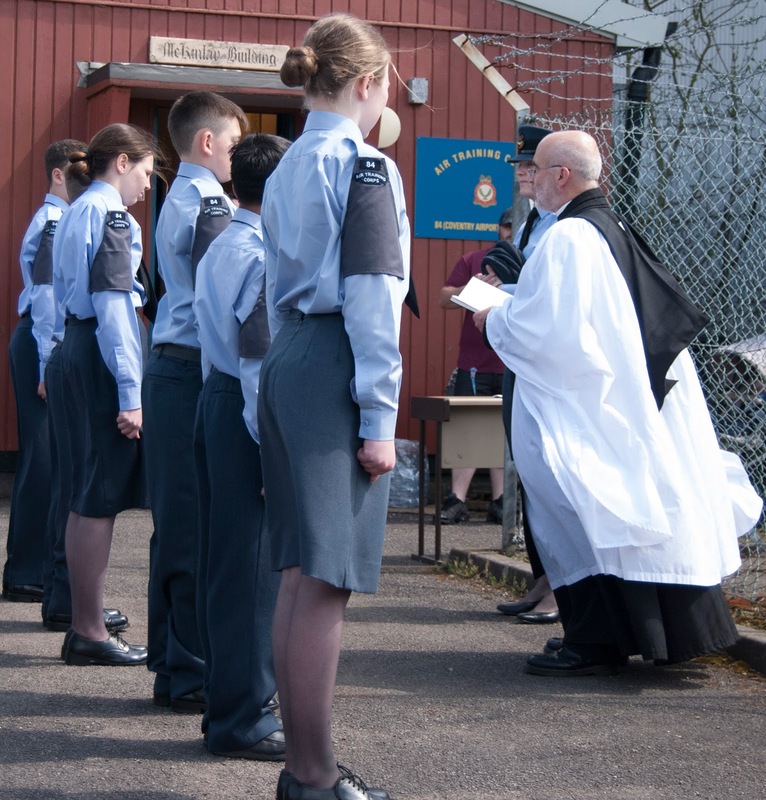 On Sunday 8th May 2016, the latest group of new recruits to 84 (Coventry Airport) Squadron were enrolled formally into the Corps by Officer-in-Charge Flying Officer Rosie Robinson and Squadron Padre, Reverend David Wintle. The group of seven new recruits started at 84 Squadron in early February and have been working towards this event for several weeks. New cadets are given a staggered programme into the squadron which includes lessons in the history and structure of the organisation, introduction to the ranks and badges as well as demonstrations of how to polish and iron the uniform. They were initially kitted with coveralls and their blue uniform was ordered according to their measurements. As well as classroom activities the recruits were given extensive practical and theory lessons in drill to enable them to take part in a basic parade. The short enrolment ceremony took place in the Squadron compound in front of parents, fellow cadets and staff from the unit. The Squadron Padre was invited to lead the ceremonial duties which included making the cadet promise and the presentation of their record of service books. Officer-in-Charge, Flying Officer Rosie Robinson welcomed them all individually and handed out their berets. Once their headdress was in place the group took their first salute before returning back to their place in the main squad. Afterwards, one of the parents commented that “it was so nice to see them all looking smart in their blue uniform. We are really proud of how much our son has learnt in the short time already and we know he can't wait to get stuck into more”. Welcome to the Air Training Corps!